If you’re looking to boost the audio in your car, you’ll quickly find that there are many ways to do so. Some audiophiles opt for extensive set-ups with things such as center channel speakers and subwoofers. However, what if you don’t have much experience with audio in vehicles? Or are working on a budget and cannot dedicate hundreds of dollars to an audio overhaul? In these situations, you may want to look into replacing the speakers in your car. Replacing your factory-issued speakers is an excellent way to boost your audio without breaking the bank. Below, we’ve compiled a list of the six best 4 inch car speakers available on the market today. If 4” speakers fit your car, you’ll want to consider these choices. 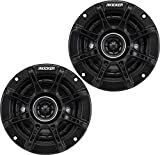 If you’re looking for a product that you can install into your car quickly, this two-way speaker pair from Kicker would be an ideal option. Installation was simple , sound quality is great and they are affordable. With a low profile, they could potentially fit in many different vehicles. 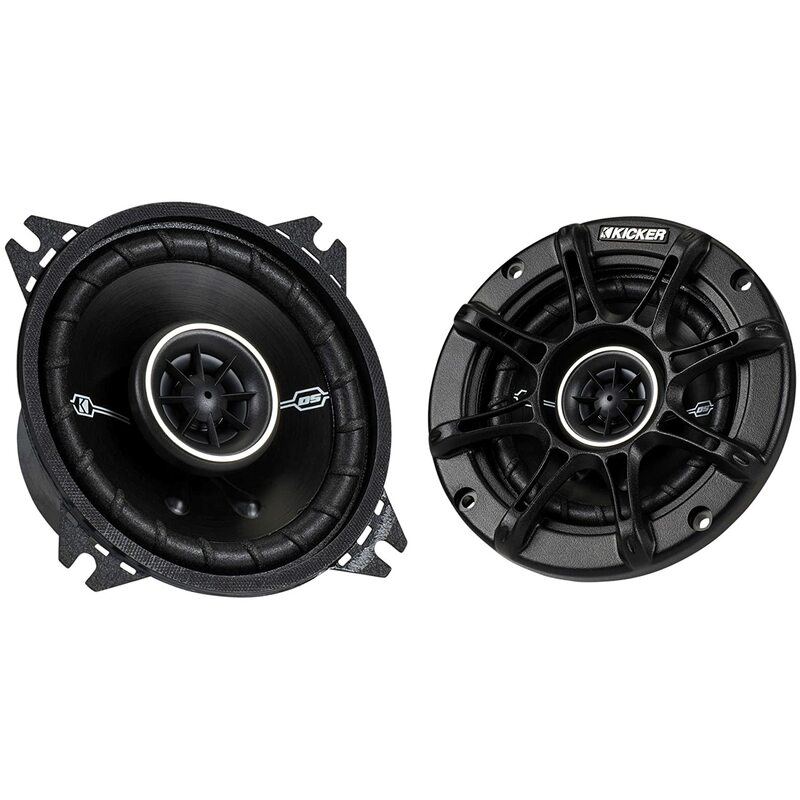 The Kicker 41DSC44 2-Way Speaker Pair is an affordable option for those looking to upgrade non-functioning speakers in their vehicle. Kicker designed these speakers with minimal tweeter protrusion. They also provide grilles. The speakers feature a 4” polypropylene woofer with ribbed polyester foam. The foam surrounds a ½” PEIN domed tweeter power range. The maximum output for the speakers is 120 watts. The speakers are a bit bulkier than other options, measuring 6.8” x 6” x 5.5” and weighing just under three pounds. The Kicker 41DSC44 also has a thin mounting profile, ideal for tight window mechanism clearances. We found that installation was simple and mounting hardware also comes included in the box. Those looking to upgrade the stock speakers in their car will want to consider these 4” speakers from JBL. Available in a set of two, you will be able to place one in each door easily. They come at a very affordable price and would be a reasonable investment for first-time audio upgrades. However, you will need to purchase lithium-ion batteries for this set of speakers. Those dissatisfied with the factory-issued speakers in their car will want to consider the JBL GTO429 Premium 4-inch Co-Axial Speakers. They feature Plus One cones that are carbon-injected. These cones are more significant than those in other 4-inch speakers , providing a booming bass. Furthermore, the GTO429 are low-impedance, which should increase the number of vehicles in which these speakers will work. We were impressed with the sound quality even though the speakers weighed a little heavy. Installation should be fairly straightforward. However, you will need to purchase two lithium-ion batteries for these speakers to work. Additionally, JBL offers various equipment that should pair well with the GTO429 such as ¾” tweeters and component speakers. You should check with your installer to make sure they fit your vehicle. 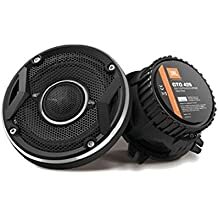 These speakers should perform much better than the stock speakers in your car, although installation could be a bit of a problem. While an OEM adapter came with speakers, some customers indicated that they still had trouble fitting the units into their car. Some said that they could not find an adapter that matches, which caused the speakers to sit at an angle. The first on our list is the Rockford Fosgate Punch P1692. Rockford is a well-known brand in the audio world. They are one of the global leaders in cutting-edge car audio technology. The Punch series has full range speakers that offer the Flex Fit basket so that the speakers can fit even in odd-shaped locations in your car. These speakers also come with Integrated Concealed Crossover (ICC), so there’s no need to mount black boxes, and they come with a grill. The Punch P1692 has a maximum handling power of 150 watts or 75 watts RMS. The sensitivity is 91 dB, and the frequency is 60 Hz-22 kHz. These speakers run longer and play louder. With a phenomenal sound quality music heard on these speakers has a much cleaner sound. Some users reported they had a little difficulty with installation , but if you can get past that , within a few hours, you should be out listening to your favorite music on these dynamic speakers. Polk is a company well-known in the audio industry, so it’s no surprise to see them make our list of the best 4” car speakers. The speakers are waterproof and are designed to withstand the elements. Customers may find that these speakers are bit pricier than other options. Additionally, they may need to replace the 12V battery frequently. The Polk Audio DB401 4” Pair Coaxial Speakers are some of the best available on the market today. The speakers have a 4.3-star rating on Amazon with nearly 170 customer reviews. Of those who reviewed the product, more than 70 percent gave it a five-star rating. Customers can purchase the product for a bit more than $50, which is a bit pricier than other speakers on the market. These speakers are durable butyl rubber, which helps them withstand the elements. They also have a liquid-cooled silk polymer that measures .75”. There is also a composite dome tweeter and a neodymium magnet. The speakers have a maximum power output of 135 watts, which is about average for a set of 4” speakers. Unfortunately, customers will find that the product is un returnable when ordering on Amazon. They should make sure to measure the slots in their car to ensure that the speakers will fit. The speakers contain a multi-hole mounting platform, which should make installation easy for most. Additionally, the low-profile should increase the likelihood of the speakers matching in a car. 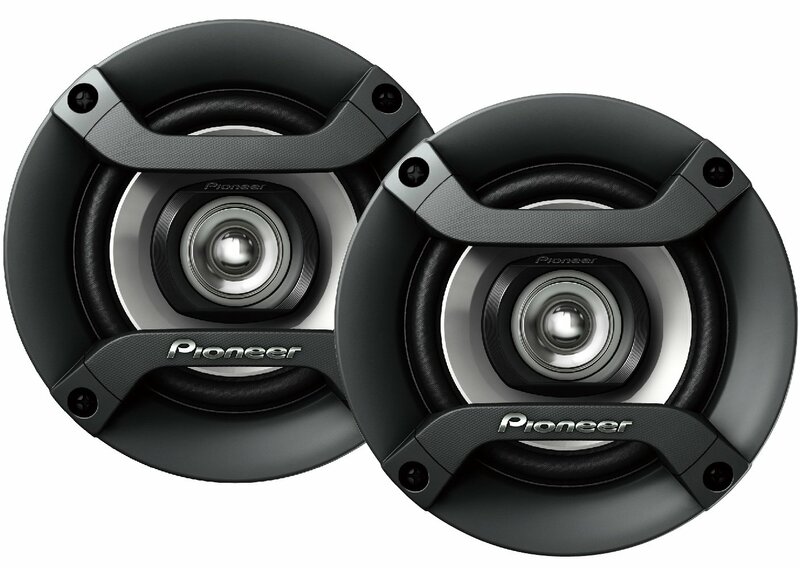 The Pioneer TS-F1034R speakers serve as an excellent upgrade to stock car speakers at a low cost. They have a max wattage of 150, which is better than other 4” speakers. Installation should be simple, although customers will want to make sure that they have less than 2” of depth. Otherwise, the sound will likely become distorted. The Pioneer TS-F1034R 4”2-Way Speakers are worth considering if you need to upgrade your car speakers. These speakers have a maximum wattage of 150W in addition to a 20-watt RMS. The two-way speaker makes for excellent ranges. Some customers indicated that the sounds suffered distortion at higher volumes. But for most people, the speakers should prove satisfactory. The unit measures 6” x 6” x 2” and weighs about two pounds. Installing these speakers is relatively straightforward. However, you’ll want to make sure that you provide a least 2” of speaker depth. If you fail to do so, you’ll likely find that the sound is distorted. We recommend measuring the space for your existing speaker before ordering these to ensure that they fit correctly. If you feel as though your car audio needs a boost, your first line of resort should be replacing your factory-issued speakers. Many cars carry 4” speakers. Replacing them should be relatively affordable and would go a long way toward upgrading your in-car experience. With the six 4 inch car speakers we’ve provided, you should be able to find a fair that meets your budget and car specs.